First off, I finished the quilting and binding on this quilt for Sydney. She pieced the top. It measures about 51″ square. I think she’s giving it to her cousin. All the green star points have been sewn, so into pairs and then I can start piecing the blocks. I cut the squares for the replacement 4-patches for this UFO. The original 4-patches are bright white and the blocks are off white/cream. I’ve got 6 different light fabrics to use in the border. These are going to be my leader/enders at the retreat this weekend. 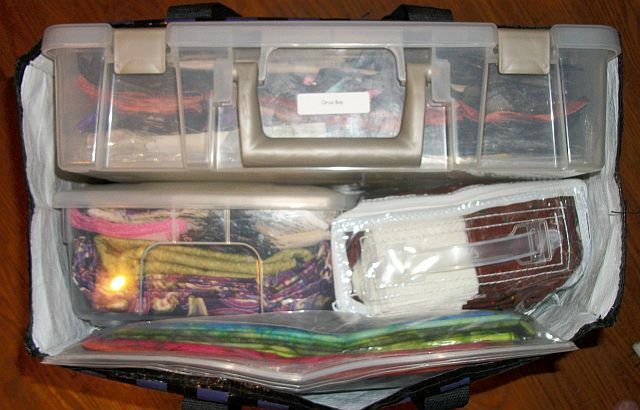 My projects are packed – Orca Bay (Bonnie Hunter, String Fling) is in the box — ooh I need to go find my Flying Geese Ruler for “squaring” the geese and put them in the box with the rest of the rulers I’m taking with me (12-1/2″ square, 6″ x 12″, Easy Angle and Companion Angle). Under the box is the box with Jared Takes a Wife and the zipper bag with Candy Sunflower Seeds (The Chain Event by Dorothy Young). In the flat zip bag is the fabric and instructions for my “August C” done in black and batiks. The plan for today is to make progress on Eeyore. 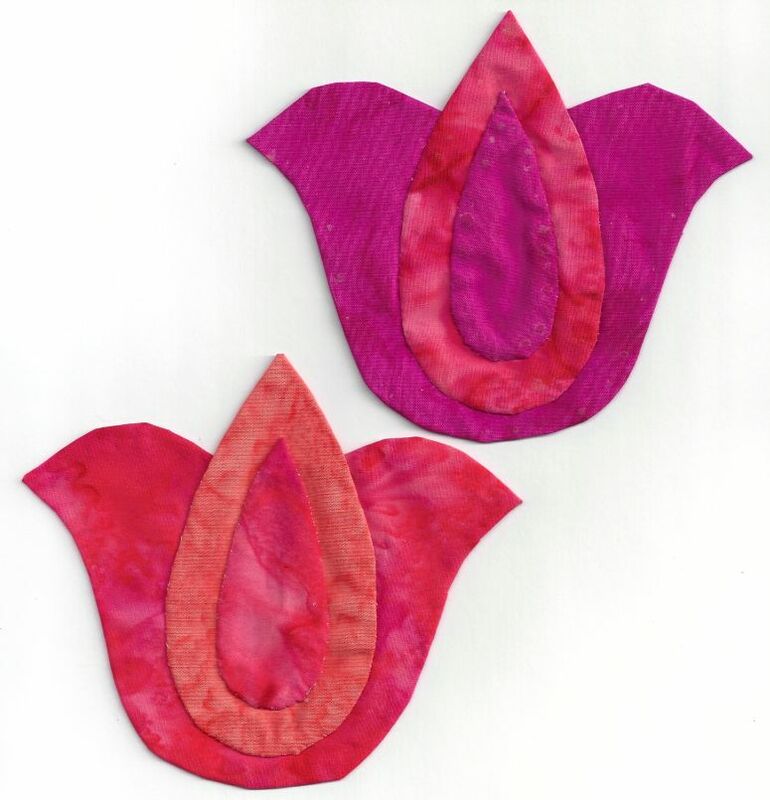 I’d really like to have the applique done by before I go to the retreat. We’ll see if that happens. To see what other are working on, check out the links over at Patchwork Times. The quilt is on the zippers and I’m ready to quilt it on Wednesday. In the meantime, I dug out the fabrics I’m planning on using on this month’s Alphabet BOM. I also re-evaluated the yellow batik I have and decided it would work on the flowers. The yellow is just glued in place – I haven’t stitched it yet. To see what others are up to, follow the links over at Patchwork Times. I do not applique — but I fall in love with many applique quilts. These two flowers are still missing a piece — I need a yellow that I don’t have in my tiny batik collection. These flowers are from Lillebet’s Garden by Beth Ferrier. Just 50 more flowers, 88 leaves and 56 stems — if I decide I really want to make this quilt. I’m not sure what is going on. 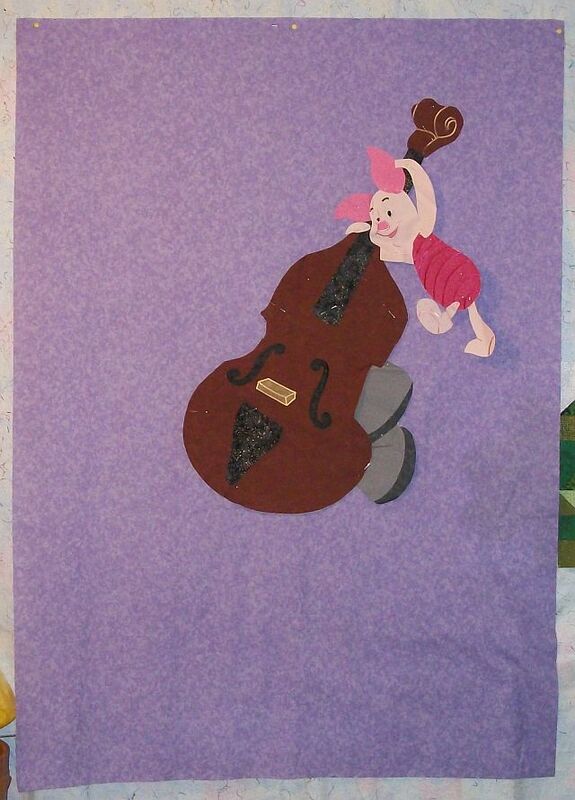 Yes, that’s Roxanne’s Glue-Baste-It which is used in appliqué. This afternoon I went out shopping specifically to buy the product. Three or four weeks ago, I picked out some fabrics for Lillebet’s Garden, a gorgeous pattern by Beth Ferrier. 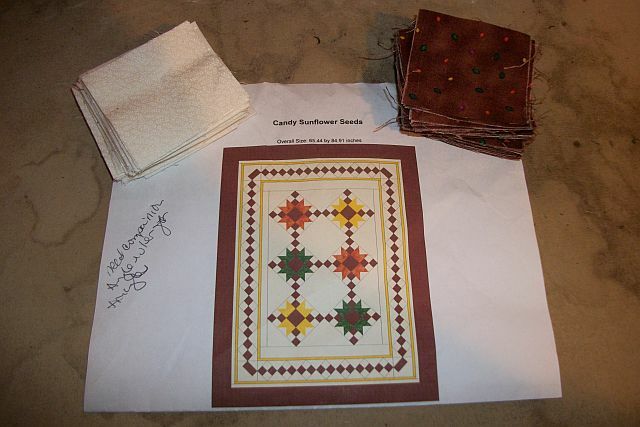 Then there’s the kit I bought in 2008 — Tulips for Beginners — another quilt with both piecing and applique. Then of course there are those Dresden Plates I finally finished, not to mention all the letters for the Crossword Puzzle quilt I’m working on. I thought my ‘mantra’ was “I don’t do appliqué”. In fact I blogged about it in 2009. 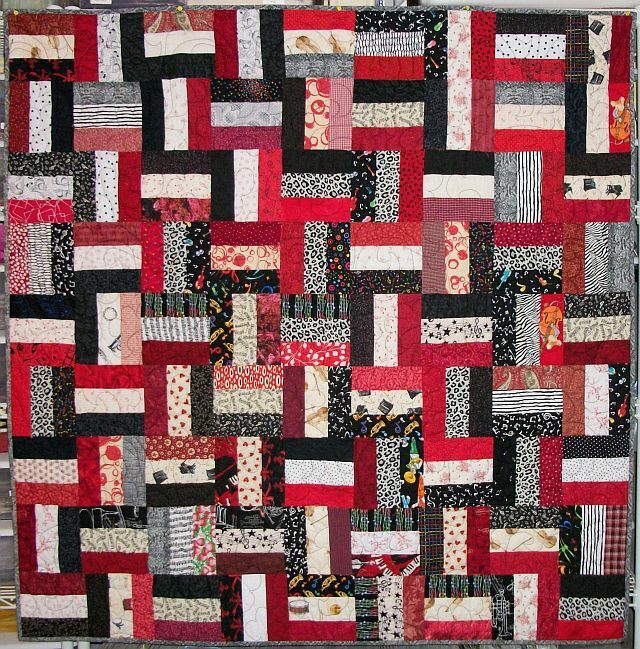 It’s block #107 from Volume 2 of Quiltmaker’s 100 Blocks. Diane Harris made it and it’s called Paisley Punch. Who knows what I’m going to do with this block. Whatever I do, it will push me outside of my comfort zone which is occasionally good thing. Option 1 or Option 2? There will be 15 total plates. Since I’m quilting them in sections, I’ll potentially need to make up my mind before I get all 15 appliquéd (there’s that word again) to the background. Judy has drawn the UFO Challenge number for February. The link to the January challenge finishes can be found here. …if I can find it. The top picture is a relatively current picture. I took it this past December. That portion of the quilt is in my UFO crate on the shelves. The bottom picture was taken a while back. I’m not sure where those two finished blocks are – or for that matter the box of black batting I purchased for the project. This project was started in 2006. Most of the prints are from the Colorworks collection which came out in the early 1990’s. I know this, because the fabric is from a “broomstick” skirt that my Mom made for me as ‘model garment’ at a now defunct chain fabric store shortly after I moved to Texas. I am here to tell you that quilting cotton does not make an easy to care for broomstick skirt. Which is not to say the skirt wasn’t cute. Mom used the same fabric to make a skirt for my sister and sister-in-law — although I don’t think their skirts had as many tiers. I loved the skirt. Wore it for nearly 10 years (I’m obviously not a clothes horse) but tended to roll over the hem when getting up from my desk at work. Since the skirt had an elastic waistband, it made for some potentially awkward moments. The last time it happened, I decided I would make a quilt from the miles of fabric in the skirt and came home and tore the skirt apart. I managed to acquire the other two skirts and found some leftover fabric in Mom’s sewing room. Of course as a project without a known destination, this quilt got set aside to languish unfinished as I worked on something else. Since it was started, I’ve completely gutted my sewing room, so there is no telling where the missing blocks and batting are. For a while, the missing batting (and maybe the missing blocks?) was in a crate sitting in the living room. Then we cleaned up the living room and the crate got moved. Our best guess is it’s in the basement – but everything in the basement got moved around not too long ago when we had the plumber out. So, before I can really begin working on this project, I’ve got to work on the basement. I wonder if Judy will let me count a cleaned basement as a finished UFO? I’ll search for the missing batting and if I don’t find it in the next two weeks, I may have to swap out UFO #10 for something else on the list. I have a new project in the works which needs to be finished by next summer. Due to circumstances, there will be a mad rush to finish it. Since it is going to require appliqué, I thought I’d start working on it sooner than later. Tonight I remembered a length of light fabric I bought based on a tiny swatch. It’s perfect for my project. Then I spotted some black fabric in one of my bins. Turns out it a big hunk as well. I need less than a yard for the appliqué, so if it turns out I need this fabric to set my Black & Bright Swap blocks I should still have plenty. 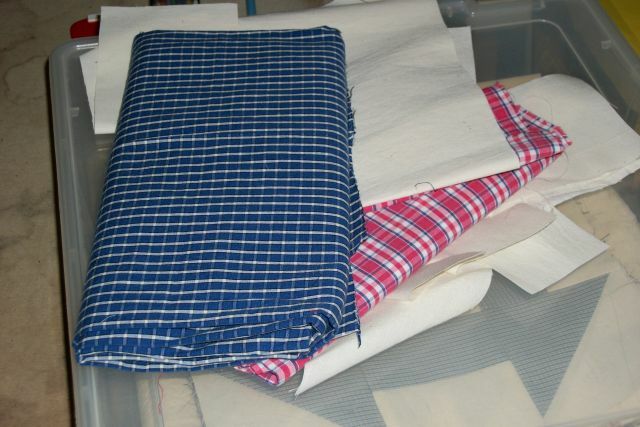 In addition to the fabric, I need freezer paper and fusible webbing. It turns out I have both in my stash, along with a spool of black thread. So, I think this quilt top will come completely from stash. Check back with me next summer to see if the backing comes from stash. I’ve previously completed the last two on the list, so it appears that I’ll be doing a bit of hand work this month, as 3 of the 5 remaining blocks are appliqué. And yes, I hand appliquéd the stem on the leaf. When the quilt is finished, I’ll try to remember to find tiny flat buttons to put in the center of circles. I just don’t think I can appliqué something that small. The first time I did this block, I didn’t even appliqué the leaves. 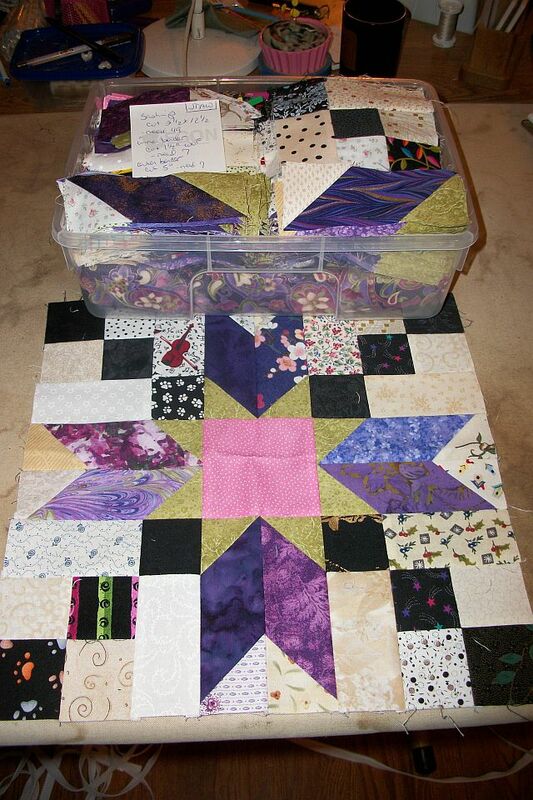 This block, along with the 4 others I did originally are in the orphan block box to be use in a future project. This has it all — that is all that I’m not fond of — weird measurements that can’t be cut large and trimmed down, triangles that have to be sewn as triangles and applique! I persevered and got it made.